It’s a bit embarrassing, really, but I have a confession to make. Something that’s been nagging at me for a little while now, and that I feel I ought really to bring out into the open. Daylight being the best disinfectant and all that. So here’s the thing. I appear to have, well, sort of misplaced a small ninja. Before you say it, I know. Ninjas are masters of stealth. They’re never missing. They’re just waiting. Biding their time. Ready to leap into action when you least expect it. But this one’s been ‘biding his time’ for a couple of months now. And I’m starting to get worried. I’m not talking about a real ninja, of course. As a cursory glance at the photo (or even a modicum of common sense) will have told you. 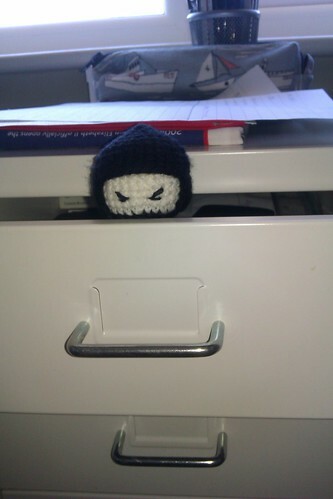 The ninja in question is, rather, a little crochet chap that Natalie, my wife, made for me. His name, perhaps a little unimaginatively, is ‘Ninja’. And he’s become the focus of this rather infantile game, in which Natalie will hide him somewhere that I’m likely to find him at some point. But somewhere unexpected, so that – in true ninja fashion – I’m not really expecting it. And when I find him, I hide him somewhere that Natalie is likely to find him, and so on. This game has gone on for a while now. And both Natalie and I were getting quite good at it, with our hiding places becoming more and more ingenious. But we seem to have got a little too good. Because Ninja has completely disappeared. Now, our house isn’t that big. So unless he’s accidentally got wrapped up with a birthday present and sent to a distant relative, I would imagine that one of us will locate him at some point. But in the meantime, all I know if that he’s out there somewhere. Biding his time. Waiting. UPDATE: After I had written this, Natalie launched a major search and rescue operation to locate Ninja. She eventually found him in the pocket of my dressing gown, which (and this may be too much information for some of you) I only wear when my in-laws are visiting. So it’s all good. Stand down. This entry was posted in Family, Home and tagged Family, Home, Ninja by Simon Perks. Bookmark the permalink.